I absolutely LOVE my Kindle. Thank you for this amazing product! As it turns out, it was not simple at all. In fact, I just plain couldn’t do it! Amazon, what?? In my efforts to find out if there was a legal way to change my Kindle screen saver, I came across several sites that help people jailbreak their devices, voiding the warranty. This is bad for customers and this is bad for you. So why are you letting this madness continue? You can give customers what they want while also benefiting. Have you noticed how many after market products (cases, skins, etc.) are selling for Kindles? 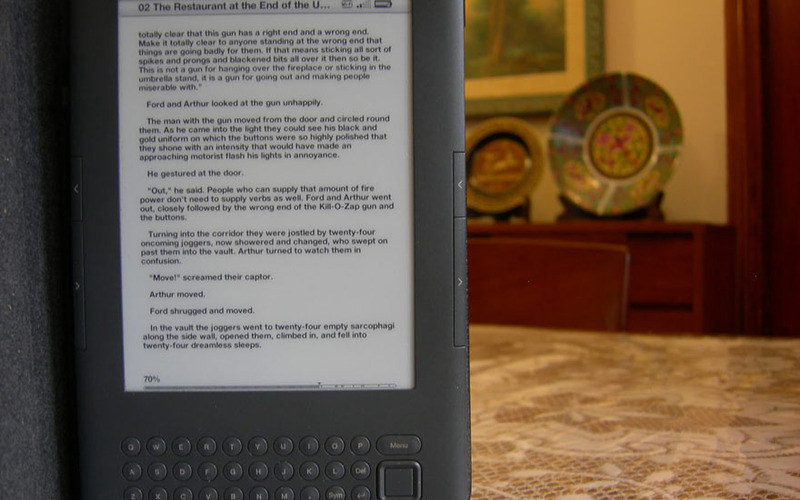 Why not release a new feature for the Kindle that allows users to replace their screen savers with new collections that you sell and make available for digital download? In addition, users could pay for an “unlock” that will cycle through the book covers of their books as the screen saver – or perhaps give users more control and allow them to use specially marked pages from their books as screen savers? Finally, you could create a special page on Amazon.com where users can upload their own artwork to be used as screen saver screens – and other users can buy them allowing the original creators and you to profit. Shoot, you could even charge users to download their own artwork to use as a screen saver – after all, you’re in control. You get to make more money off the lucrative customization market. You discourage people from hacking their devices, thus maintain control of your product. Your customers get the customization they way for their device. Your customers can maintain the integrity of their product software and warranty. This is just one tiny idea I have about ways you can deliver more value to your customers through just the existing current generation Kindle devices. I would love the opportunity to discuss with your some more ideas about how you can deliver value, and create opportunities for your company with digital devices such as the Kindle. Then again, I’m sure you have all the best minds working on these problems right now, don’t you? Well, if you want one more, give me a call. This entry was posted in Blog, Dear Business by Zachariah Wiedeman.